November 20, 2009 Dan O.
Nic Cage takes a ride with a bunch of convicts featuring Dave Chapelle, yeah this is a movie. When the government puts all its rotten criminal eggs in one airborne basket, it’s asking for trouble. Before you can say, “Pass the barf bag,” the crooks control the plane, led by creepy Cyrus “The Virus” Grissom (John Malkovich). Watching his every move is the just-released Nicolas Cage, who’d rather reunite with his family. John Cusack plays the creator of the plane and stands by as his whole dream turns into a nightmare. 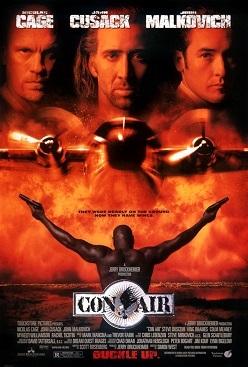 Con Air combines elements from many other films such as Airplane!, The Rock, The Dirty Dozen, and a little bit of Silence Of The Lambs. Now all of this may seem like a weird combination for a film, but it turns out to be one of my favorite action films of all-time. First of all, the great thing about Con Air is that it doesn’t take itself too seriously. Scott Rosenberg’s ultra macho script knows it is having a lot of fun with the writing, and it brings in a lot of good laughs. The tongue-in-cheek approach that this film had never really dies out, cause although some of the lines may be cheesy, they are still hilarious and well worth it. The action that takes place in this film isn’t so bad either. I liked how it was fun but it wasn’t non stop to the point of where there’s no room for a story to take place. The things that happen in this film seem very believable and the action is never too dumb to where its unbelievable. The only problem I really had with this film was that it was working out really well by the end, and it loses itself in a routine explosive third act. Yeas, it was very good and fun to look at, but it just didn’t seem like it was needed for this film. I liked how the action took place in that scene, but when it was all said and done I felt like everything else sort of was lost cause of it. The acting in this film is pretty good but mostly from Malkovich. He plays this slick, witty, and actually pretty smart villain that you want to hate cause he’s so crazy, but you can’t help but to love cause of his amazing apporach to the lines and the events that happen. Cage, I thought could have done a lot better, but his accent by the end just got really annoying for me, and by the end I just couldn’t stand it. Steve Buscemi plays a little side character in this film that is really funny, and by the end of the film, he turns out to be the most-liked character from the whole film. Consensus: Con Air is full of energy and humor, that is fun to be a part of and does hit the right spots every time throughout the movie. Though the ending was a little bit out of hand, the film still holds a great place in my heart. One of my all-time favorite guilty pleasures! Between this one and FACE/OFF, ’97 was a great ime for thos of us who love Cage-o-riffic action. Hahahah yeah there were so many of those lines, that were hilarious. This film is such a great watch. Cage and Malkovich are terrific. It would have been interesting to see a different take on the story, which has the potential to be very powerful, but as it stands, it is still a solid film.